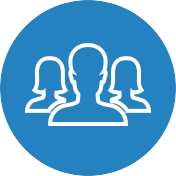 As the most flexible joint in the body, the shoulder is absolutely essential for the arm movement. It allows the arm to rotate in a variety of positions: to the front, above the head, to the side, and behind the body. The shoulder joint consist of three important bones: acromion, clavicle, and cracoid process. Besides these bones, the shoulder joint is formed by the following bone structures as well: rotator cuff, bursa, and labrum. Since it is one of the most active joints in the body, the shoulder is particularly vulnerable and prone to different shoulder injuries. 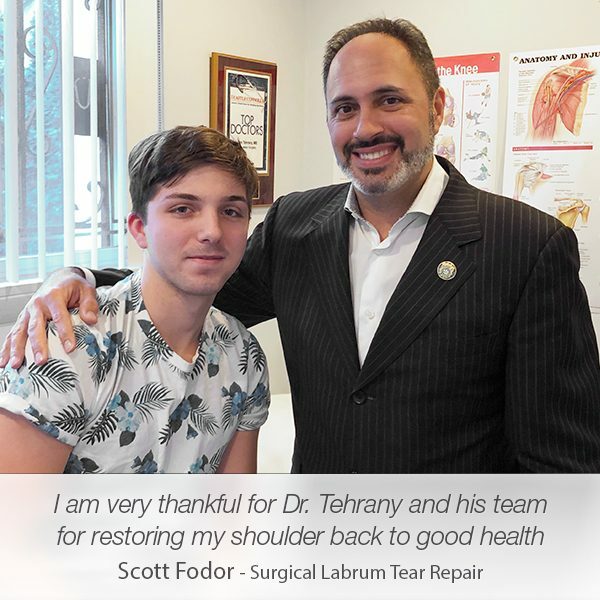 Dr. Armin Tehrany, the founder of Manhattan Orthopedic Care, and one of the most reviewed shoulder doctors in New York, is specialized in the treatment of the shoulder with an extensive record of success stories. 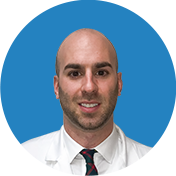 His profound knowledge and outstanding surgical skills, rank him among the top New York shoulder specialists. 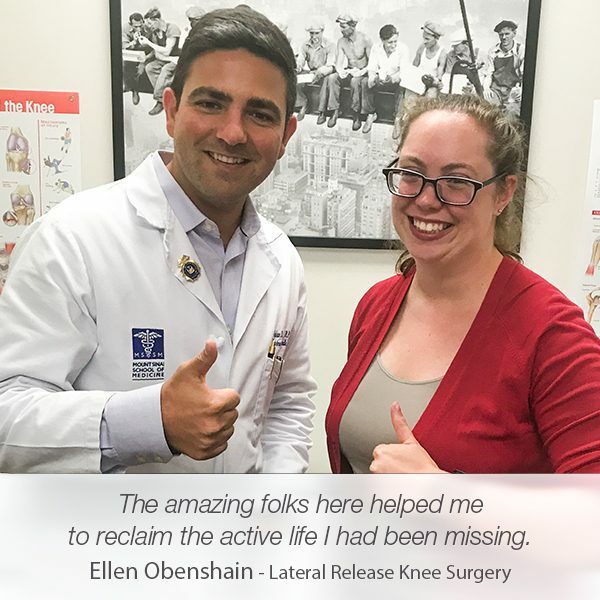 His team of compassionate and enthusiastic physician associates together with orthopedic staff is keenly devoted to helping the patients overcome their orthopedic problems with ease and the utmost comfort. The treatment of Joseph Bugliaro was no exception. 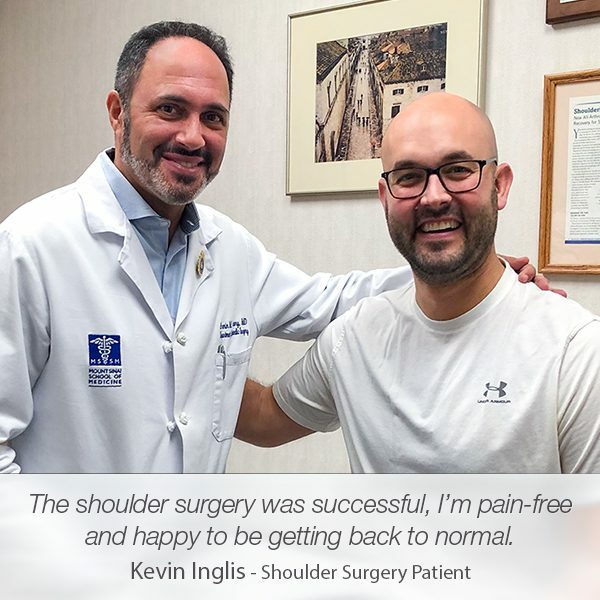 His shoulder injury was a source of a terrible pain and discomfort that significantly impacted his everyday life. 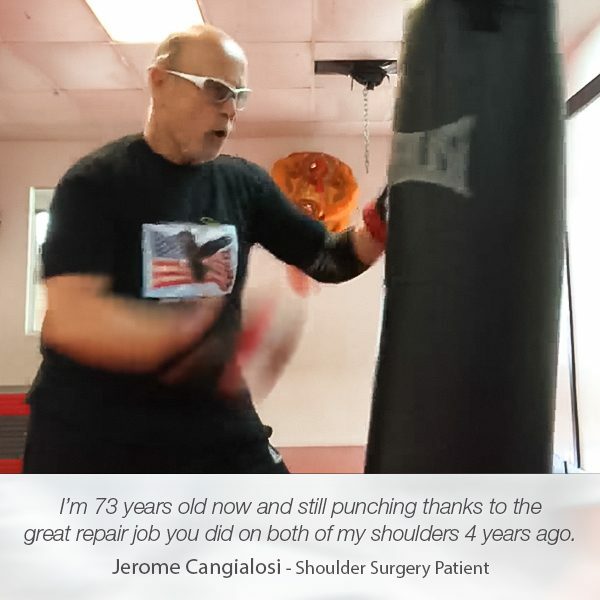 Due to the severity of the injury, Joseph was immediately scheduled for a shoulder surgery. 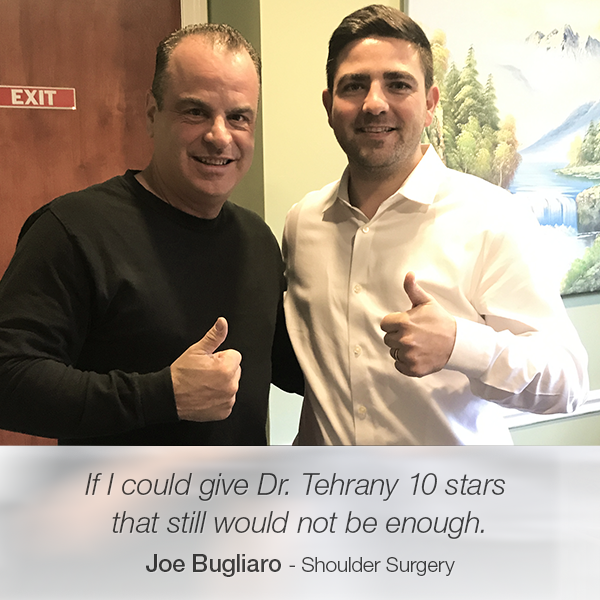 During the entire surgical process, the team led by the top New York shoulder doctor, Dr. Tehrany, ensured that Joseph was treated with a superb orthopedic care. Dr. Armin Tehrany is the best surgeon. On May of this year (2017), he performed surgery on my left shoulder. 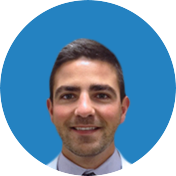 From his professional staff to his superior bedside manner, I could not have asked for anything better. 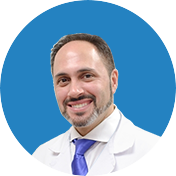 Dr. Tehrany is always there, answers any questions you may have, and explains them in a way you can understand. You will always know what to expect prior to, during, and after surgery. If I could give Dr. Tehrany 10 stars that still would not be enough.